Need an iPad transfer for moving files from iPad, the new iPad, iPad Mini, iPad 4 to PC? You don't have to dive into the wide world of costly iPad transfer tools. Syncios iPad transfer is an excellent piece of iPad transfer freeware which helps you transfer music, iTunes top movies, DVD movie, photos, TV shows, Podcasts, iTunes U, Camera Roll, eBooks in PDF or ePub format, Voice Memos, camera shot between iPad and computer. As a powerful iPad to pc transfer, Syncios can access to any file in iPad, allows you to manage and export needed files from iPad to any desired PC for backup. Also designed as an iPad manager, Syncios iPad Transfer simplifies the iPad management into easy process of a few clicks. With this iPad transfer software, you are able to manage and transfer app (*.IPA), movie (. *MOV, .*M4V, . *MP4), music (.*MP3, . *M4A), ringtone (. *M4R), audiobook (. *M4B), eBook files (ePub, PDF) and any iPad supported file between iPad, the new iPad, iPad Mini, iPad 4 and PC or even share files between Apple devices. If you would like to transfer data from your old iPad to your new iPad, including new iPad Air 2, you can use this One Click Phone to Phone Transfer. Beside featuring the data transfer, it can also helps you backup your iPad data to your computer, restore data from local backup, as well as saved iTunes backups at any time you want. Fully support iPad Air, iPad 4, new iPad and all other Apple devices. With Syncios iPad Transfer, there will not be any limitations in copying and transferring iPad files to PC any more. Syncios iPad Transfer allows you to export your photos, music, podcasts, ringtone, movie, TV show, camera roll, ebook and any media contents from iPad to your PC or new laptop for backup. It supports several different iOS version. No iOS upgrade, no network or wifi needed. 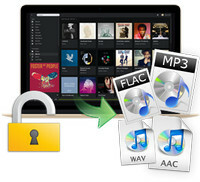 Now, you can be free from the trouble of losing your favorite movie or songs in your iPad. Syncios iPad Transfer can also work as iPad manager & PC to iPad transfer. This intelligent iPad transfer will automatically detect device info and media info inside, so that you can get every detailed info of the device like capacity status and other file data such as version, size, artist, song duration, album name, etc. Using this iPad transfer tool, you can install or uninstall app, creat new playlist, photo libary, import music, video, pictures, ebook, audio book and many other types of files from local hard drive to your iPad, delete unwanted files from iPad to release free space for storing new movie, new album, etc. With Syncios iPad Transfer, there will not be any limitations in copying and transferring iPad files to PC any more. Syncios iPad Transfer allows you to export your photos, music, ringtone, movie, TV show, camera roll, ebook and any media contents from iPad to your PC or new laptop for backup. It supports several different iOS version. No iOS upgrade, no network or wifi needed. Now, you can be free from the trouble of losing your favorite movie or songs in your iPad. Syncios iPad Transfer upgrades your iPad media sharing experience by providing the simplest way to transfer your iPad music, photos, movie, TV show, music video, audiobook and other media files between iPad and PC. Specially designed for Apple Users, Syncios iPad Transfer has a simple and well-organized interface which enables you to transfer iPad media files without struggling on cumbersome tutorials. How to transfer iPad files to PC? The whole process is easy as 1-2-3: Connect iPad --> Choose file --> Transfer File. Why choose Syncios iPad Transfer? 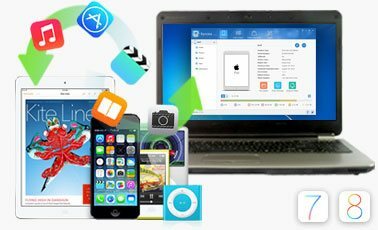 Besides the capability of transferring iPad music, iPad video and other file to PC, its great compatibility would be the answer. 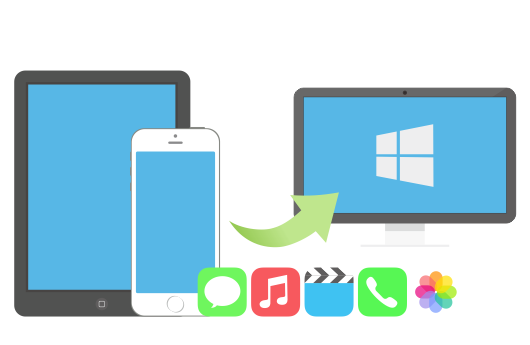 Syncios iPad transfer supports a wide range of iOS device, file type, language and more. It can surely do a great job for you in iPad files transferring and sharing. Supported iOS: iOS 12 , iOS 11, iOS 10, iOS 9, iOS 8, iOS 7, iOS 6, iOS 5. File format: Image(JPG, JPEG, PNG, BMP, TIF, TIFF), Video(MOV, M4V, MP4), app(IPA), Audio(MP3, M4A, WAV, AIFF, M4R, M4B). English, French, German, Spanish, Japanese, Traditional Chinese, Simplified Chinese, Korean, Portuguese, Turkish, Thai, Vietnamese, Italian. And more languages are coming soon! Note: This Syncios iPad Transfer supports also Android phone and tablet, compatible with Android 3.0 to 9.0 and above version. 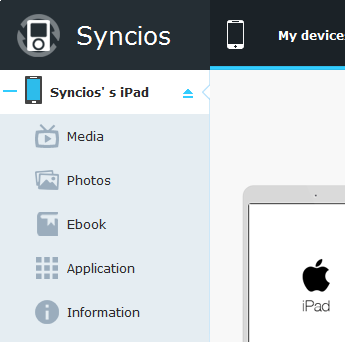 With Syncios iPad Transfer, you can have a lot to do with your iPad. Apart from sharing game apps, hot movie, pop star photos, pop music with friends, you can also use it as an external drive for convenient storage. You can even transfer all your favorite movie, web videos, home-made videos, dowloaded music from PC onto your iPad. 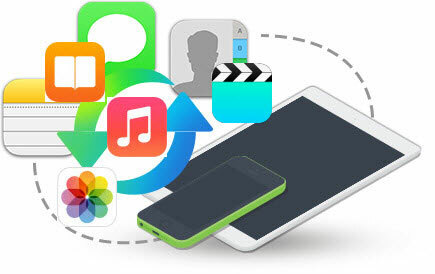 The built-in audio & video converter helps you to easily get music, ringtone and movies into iPad-ready files. You can explore more utility with this powerful iPad transfer software, just download and try! Apple Music has always been a popular music streaming service since people can download music to stream to their devices for offline access. It would be more convenient if you convert the downloaded music to common formats so as to stream to non-Apple devices like Samsung, MP3 Player, MP4 Player, etc. To do this, you’ll need NoteBurner iTunes DRM Audio Converter (For Windows & For Mac), a professional Audio Converter to convert Apple Music files to MP3, AAC, etc. Besides, it can convert M4A/M4B/AA/AAX audiobooks and M4P music at 20X faster speed with lossless quality. Try the free trial Now!